A top quality tactical flashlight offers numerous features that make it a must-have when you are exploring the outdoors at night, finding your way around when the power goes out or heading to your vehicle after the sun goes down. 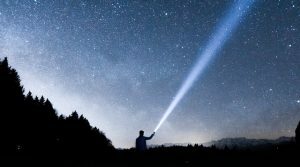 A good tactical flashlight offers more features than standard versions, but there are five essential features that are necessary for this device to be considered for your purchase. The first and most obvious essential feature is that the flashlight needs to produce at least 130 lumens on its brightest setting. At night, this level of brightness will become temporary blind and disorient a potential attacker which provides you time to flee, produce another defensive weapon, or use the flashlight to defend yourself. Anything above 300 lumens is arguably not necessary, but that kind of brightness will not only work against assailants but also help attract attention to your location if you should get lost in the woods. This is the second setting of the light, something from 10 to 50 lumens which provides enough light to navigate successfully in the dark while using as little power as possible. This is perfect for rummaging around your home in case the power goes out for several hours or when outdoors and the sun goes down. On this setting, you should have plenty of power to run the light for days at a time. Plus, you can switch to the brighter light to attract attention if needed. Another aspect that separates tactical versions of flashlights from their conventional counterparts is the material that makes up the casing. You’ll want a hard, aluminum casing that has rubberized or plastic reinforcements around the lens and on the back end. This provides you with a striking weapon that can be used after temporarily blinding an attacker with the light itself. Plus, aluminum will never rust and will hold up against the bumps, scrapes, impacts, and drops that many tactical flashlights undergo during their lifetime. You’ll need to be able to use your tactical flashlight in all sorts of weather conditions, so it needs to be more than just water resistant. A waterproof military flashlight will keep working even if you dropped it in a puddle or other body of water. Plus, it will resist the rain, sleet, and snow while continuing to work. Be sure that the tactical flashlight you choose is waterproof. Sometimes, a bright light is not enough to get people’s attention if you are lost in the outdoors or need assistance in the city. A flash setting that offers strobe or staggered pulses of light is far more likely to be noticed and get you the attention needed. It is often the third setting on most tactical flashlights and can be used when you require assistance. The exact type of flash or pulse setting is not that important, only that if offers one for your needs. The best tactical flashlight will include all five features and provides you with an excellent tool for nighttime navigation, self-defense, and attracting the attention of others.